British-Israel.us - Lesson 39 - Mankind's 6000-Year History! What's wrong with the chronology taught in public schools? Could humans be only 6000 years old? Does the Bible really teach a 6000-year history of mankind? We read in 2 Peter 3:8 that "one day is with the Lord as a thousand years, and a thousand years as one day." Also, "a thousand years in thy sight are but as yesterday" (Ps.90:4). Revelation 20:1-7 mentions a period of "a thousand years" during which Satan is chained and the saints live and rule with Christ. This thousand-year period is called a "rest" which Christians can "enter into" if they aren't "disobedient" (Heb.4:1,6,10,11; ASV, Gspd, Moffatt, Ber, Bas). Just as God physically created the earth in six literal days, making man in his physical image, and rested on the seventh day, so also he is creating his spiritual image of moral character in man for 6000 years before the Millenium when man will have a chance to rest. The Sabbath is "a shadow of things to come" (Col. 2:16-17). The penalty God threatened Adam with was that, "in the day thou eatest thereof thou shalt surely die" which caused Adam as well as all his descendants to die within 1000 years of their birth. A week is therefore 7000 years. Let's prove whether or not mankind is 6000 years old using Bible chronology. Note: Our B.C. and A.D. designations do not refer to "Before Christ" and "Anno Domini" (in the Year of our Lord) because that would be inaccurate. Our Lord was born in 4 B.C. Therefore, B.C. means "Before Contemporary" and A.D. means "Annual Date". (1.) 3960-3959 B.C. to 2304-2303 B.C. ; 1656 years; Gen.5 & 6; Creation to Flood. (2.) 2304-2303 B.C. to 1952-1951 B.C. ; 352 years; Genesis 11 & 12, Acts 7:4; Flood to Abram's Birth. In Genesis 11 and 12, "begat" means "gave birth to" since "begot a son in his own likeness" (Gen.5:3) means it was no longer in the womb. Therefore it is 352 years exclusive, not 344 inclusive counting. If we used inclusive reckoning (counting one year twice in each generation), Methuselah would survive the flood! But by exclusive reckoning, the last year of his life is the year of the flood. Also, using 352 + 75 we get 427 years (almost 430) whereas 344 + 75 gives a number of no significance (419). (3.) 1952-1951 B.C. to 1877-1876 B.C. ; 75 years; Genesis 12:4 (427 years); Abram's Birth to Confirmed Covenant. Some people think the covenant was confirmed when Abraham was 99 in Genesis 17. But this can't be because it doesn't begin the sojourning of the children of Israel and isn't the first time the promises were confirmed. It doesn't fit the 430 year parallels either which must both start and end the same year. Abraham was born 352 years after the flood because Terah was 205 and "died in Haran" (Gen.11:32). Then Abraham, "when his father was dead" (Acts 7:4), moved to Palestine at the age of 75 (Gen.12:4). Thus, Abraham was born when Terah was 130, so Genesis 11:26 should be paraphrased, "Terah lived seventy years, and begot the first of his three sons (not Abram)." Therefore, Abraham was born in 1952-1951 B.C. 1656 + 352 + 75 = 2083 years. Abraham was still 75 years old in Genesis 13:14-16 (when the "covenant" was "confirmed") because, 430 years later (Gal.3:16-17), "the law" of rituals was given (Ex.24:12) the same year as the exodus (Ex.14) which was 430 years after Genesis 12:4 (Ex.12:40-41). So 2083 plus 430 gives 2513 or 1447-1446 B.C. for the exodus. Regarding how many went into Egypt, see Genesis 46:26,27, Exodus 1:5 and Acts &:14. There were 75 including Joseph's additional descendants in Egypt. There were 70 if we only include Ephraim, Manasseh, and Jacob's wife and Jacob. There were 66 if we exclude all of the above. (see When Critics Ask by Geisler, p.433). Incidentally, Joseph's 7 years of plenty and 7 years of famine were from 1670 till 1656 B.C. since he was age 30 when he stood before Pharaoh at the beginning of this 14-year period (Gen. 41:46); and the Exodus in 1446 B.C. was 430 years after Abraham entered Canaan. "The sojourning of the children of Israel (which included Abraham) ... was 430 years" till the Exodus (Ex. 12:40-41). Therefore Abraham began sojourning in Canaan and Egypt in 1876 B.C. when he was 75 years old (Gen. 12:4). 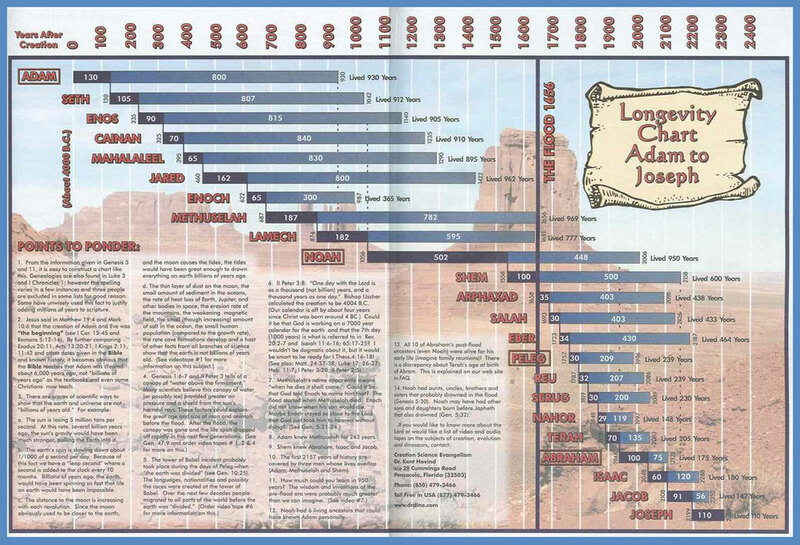 The time span from Abraham's 75th year till Joseph's 30th year can be determined using the "begat" verses. The sum is exactly 206 years (Gen. 16:16; 25:26; 47:9; 41:46-53; 45:6) making the date when Joseph stood before Pharaoh equal 1670 B.C. (4.) 1877-1876 B.C. to 1447-1446 B.C. ; 430 years; Gen.12:4; 13:14-16; Ex.12:40-41; 14 & 24:12; Gal.3:16-17; Confirmed Covenant to Exodus. The 430 years must begin in Abraham's lifetime, not Israel's or Jacob's, because the 400 years which ends also at the exodus specifically starts at Isaac's affliction by Ishmael (Gen.15:13; 21:8-12; Acts 7:6) which therefore began 30 years after Abraham entered the land. Incidentally, a generation is defined as 100 years in Genesis 15:13-16. Exodus 12:40-41 says, "now the sojourning (in Canaan and Egypt -- 215 years each) of the children of Israel (which here includes Abraham, Isaac and Jacob -- see footnotes in both the Companion Bible and Jerusalem Bible), who dwelt in Egypt, was 430 years." Josephus says the same thing: "They left Egypt ... on the fifteenth day of the lunar month (Num. 33:3), four hundred and thirty years after our forefather Abraham came into Canaan" (Ant.2:15:2). Both the Samaritan Pentateuch and Septuagint add "and in Canaan" in verse 40. Some translations say Israel dwelt in Egypt 430 years which contradicts Galatians 3:17. "Thy seed shall be a stranger in a land that is not theirs, (first Canaan -- Ps. 105:11-12 & then Egypt) (and shall serve them; and they shall afflict them beginning with mocking, when Ishmael, the son of an Egyptian, persecuted Isaac, who was born after the Spirit -- 21:9; Gal. 4:29. It continued in loathing; for it was an abomination to the Egyptians to eat bread with the Hebrews -- 43:32; and it came at last to murder of their new-born children) FOUR HUNDRED YEARS" (15:13; Acts 7:6), not counting from the birth of Isaac ("thy seed"), but counting from the "mocking" he received from Ishmael in 1846 B.C. This is because "Abraham was an HUNDRED YEARS old, when his son Isaac was born unto him" (Gen. 21:5). But "Abram was SEVENTY-FIVE years old when he departed out of Haran" (Gen. 12:4).That is 25 years' difference. But we need 30 years' difference between the 400-year period and the 430-year period. In the book of II Maccabees, 7:27, a mother mentions giving milk to her son for THREE YEARS as though this was normal. If Isaac was weaned after FIVE YEARS, then we have the 400-year period beginning in Genesis 21:8-9 when Ishmael started "mocking" a FIVE-YEAR-OLD Isaac, and the 430-year period beginning in Genesis 13:14-16 when the covenant was confirmed to Abraham (Gal. 3:16-17) at age 75. Both periods end in their departure from Egypt in 1446 B.C. Since 405 years elapse from Isaac's birth to the Exodus, we can conclude that 505 years elapse from Abram's birth to the Exodus since "Abraham was an hundred years old, when his son Isaac was born unto him" (Gen. 21:5). Thus 1446 B.C. + 505 years = 1951 B.C. for the birth of Abram. This can be confirmed independently. Terah was 205 and "died in Haran" (Gen.11:32). Then Abraham, "when his father was dead" (Acts 7:4), moved to Palestine at the age of 75 (Gen.12:4). Thus, Abraham was born when Terah was 130, so Genesis 11:26 should be paraphrased, "Terah lived seventy years, and begot the first of his three sons (not Abram)." Using the begat verses, 130 + 29 + 30 + 32 + 30 + 34 + 30 + 35 + 2 + 1 = 353. Therefore, 1656 + 353 = 2009 years till Abram was born. In other words, 3960 B.C. - 2009 years = 1951 B.C. Exodus 12:40-41 says, "now the sojourning (in Canaan and Egypt -- 215 years each) of the children of Israel (which here includes Abraham, Isaac and Jacob -- see footnotes in both the Companion Bible and Jerusalem Bible), who dwelt in Egypt, was 430 years." Josephus says the same thing: "They left Egypt ... on the fifteenth day of the lunar month (Num. 33:3), four hundred and thirty years after our forefather Abraham came into Canaan" (Ant.2:15:2). Both the Samaritan Pentateuch and Septuagint add "and in Canaan" in verse 40. The Septuagint, quoted by Paul in Galatians, says "the sojourning of the sons of Israel who dwelt in the land of Egypt and Canaan was 430 years" because they dwelt in Canaan before they dwelt in Egypt. . 5.) 1447-1446 B.C. to 967-966 B.C. ; 480 years; 1 Kings 6:1; Exodus to Temple Foundation. Now Moses was born "fourscore" years before the exodus (Ex.7:7) or 1527 B.C. He was raised by "the daughter of Pharaoh" (Ex.2:5) who is known in secular history as "Hatshepsut." She was the daughter of Pharaoh Thutmose I, the son in law of Ahmose. Moses, after murdering an Egyptian, fled from Thutmose III (c. 1482 - 1450 B.C.). Then Amenhotep II (1450 - 1425 B.C.) was the arrogant and haughty pharaoh of the exodus (Ex.7). The suffix "mose" means "son" (p.115, Keller's Bible As History). Thutmose and Ahmose were sons of Thut (scribal god) and Ah (moon god). But nobody knew who the father of Mose was, so he was just called "Moses." Or perhaps Moses' name had a prefix like the others but Moses "refused to be called the son of Pharaoh's daughter" (Heb.11:24) or Hapmose or Irumose ("Son of the Nile") (SDABC 1:504). We also find "Kamose" where Ka is the deified soul god and "Rameses" where Ra is the sun god (World Of Moses, p.25, Paul Bork). Amenhotep II apparently lived 17 years after the exodus since his mummy is in the Cairo museum today. Exodus 15:19 should say "horses." Psalm 136:15 "overthrew" does not mean "killed." Judges 11:26 says Israel dwelt in Heshbon 300 years (about 1409 to 1109 B.C.). Therefore the reigns of the judges were overlapping. If consecutive they would total 410 years -- too long for 1 Kings 6:1 and Acts 13:20. We have to decide between 396 years (1 Ki. 6:1: 480- 4 - 40 - 40 = 396 years) and 496 years (Acts 13:20). Some chronologists have said that 1 Ki. 6:1 should say 580 in light of the fact that in Hebrew the numbers 4 and 5 closely resemble one another, so much so that in 2 Kings 14:23 the reign of Jerebooam II is given as 41 years whereas it must have covered 51 years in order to correspond to the kings of Judah. But we believe that 1 Kings 6:1 is correct; and Acts 13:20 refers to 450 years from the birth of Isaac till the promise of land was fulfilled -- not the duration of judges. From the Exodus to Heshbon is 38 years (Deut. 2:24-37 -- 1447-1409); from Heshbon to Jephthah is 300 years (Judges 11:26 -- 1409-1109) and from Jephthah to Solomon is 142 years (1109-967), making 480 years total (1 Ki. 6:1) (see John Garstang's Joshua and Judges, pp. 54-60). Just because Exodus 1:11 mentions "Raamses" doesn't mean Ramsees II had to reign before the exodus. It could have been a later revision of Moses' writings by Samuel. The same is true of "Pithom" ("the abode of King Thom") proposed by Velikovsky and Courville. It was a later revision just as Genesis 14:14 mentions the city of "Dan" before the man was even born. Incidentally, 2 Kings 7:6 is invariably ignored by Egyptologists since it doesn't agree with Manetho's kingly dynasties and lengths of reigns suggesting only one pharaoh at a time ruled over the entire land of Egypt. But 2 Kings 7:6 mentions "kings of the Egyptians" coexisted. Incidentally King David's reign ended in 971 BC (1 Ki. 6:1) and therefore counting backward from 971 BC 40 years + 30 years (2 Sam. 5:4) we arrive at David's birth in 1041 BC. (6.) 967-966 B.C. to 931-930 B.C. ; 36 years; 1 Kings 11:42; From temple foundation (in the fourth year of Solomon's reign) to the end of Solomon's rule. Solomon reigned 40 years. (6.) (alternate) 967-966 B.C. to 537-536 B.C. ; 430 years; Ez.4:1-7; 1 Ki.11 & 12; From Temple Foundation to First Return (Cyrus). This prophecy may also refer to the captivity of Israel in 721 B.C. by Shalmaneser of Assyria which lasted for 390 years (Ez.4:3-5) bringing us to 331 B.C. when Medo-Persia was conquered by Alexander the Great who defeated Darius at Gaugamela. The date of the fall of Samaria is 718 B.C. because Josephus says, 182.5 years before Cyrus' first year -- 536 B.C. (7.) 931-930 B.C. to 586-585 B.C. ; 345 years; Kings and Chronicles; From the end of Solomon's reign to the destruction of Jerusalem. ("During the reign of Romulus... they only kept to the one rule that the whole course of the year contained three hundred and sixty days." -- Plutarch (75 A.D.) But "Hermes playing at draughts with the moon, won from her the seventieth part of each of her periods of illumination, and from all the winnings he composed five days, and intercalated them as an addition to the 360 days" (Plutarch Isis and Osiris (c. A.D. 80). The early Hebrew, Roman, Persian, Greek, Phoenician, Egyptian, Mayan, Hindu, Etruscan, Teuton, Chinese and Babylonian calendars were all 360 days long with 12 months of 30 days each until this time.They all changed around 701 B.C. at the time of Hezekiah's sundial moving back. An average of half a year should be deducted for each of eighteen patriarchs and the twenty kings to allow for the overlap of their periods. In the Scriptures, as generally in the East, the rule is to state parts of years as years. For example, Zedekiah is is stated to have reigned eleven years, but according to Jeremiah 52:6, his reign lasted actually ten years four months and nine days. Meanwhile, comparing Dan. 1:1 with Jeremiah 25:1 and 46:2 we conclude that Jerusalem was conquered by Nebuchadnezzar in 604 B.C., the fourth year of Jehoiakim, when Nebuchadnezzar defeated Pharaoh Necho, King of Egypt, at the Battle of Carchemish (Jer. 46:2). Jeremiah 25:1 is the perfect connecting link between sacred and profane chronology: “The fourth year of Jehoiakim, which was the first year of Nebuchadnezzar.” Claudius Ptolemy (70-161 A.D.) lists Nebuchadnezzar's first year as 604 B.C. which agrees perfectly. Also Berossus. Cambridge Ancient History follows this chronology. Don't be deceived by those who reject Ptolemy's Canon -- a list of the reigns of kings covering nine centuries (Almagest). From Nabonassar's accession as first king of Babylon, Feb. 26, 747 B.C., to Alexander the Great, the length of every reign given in Ptolemy's Canon is corroborated by one or more of a series of ancient documents—chronicles, king lists, inscriptions, astronomical texts, and business texts in both clay and papyrus—that are dated in specific regnal years of various kings. (Babylonian Chronicle; Esarhaddon Chronicle; Chronicle of the Years 680-625; Chronicles of Chaldean Kings, Babylonian King List A, eclipse tablet LBART 1417, Nabonidus' Harran Inscription, the Nabonidus Chronicle, the Behistun Inscription, the Saros Tablets, Daliyeh Papyrus 1, and various dated business tablets.) These records come primarily from Babylon, but also from Egypt and even from Persia. (8.) 586-585 B.C. to 516-515 B.C. ; 70 years; Daniel 9:2; Ezra 6:15; Zech.7:5-7; From the destruction of the first temple to the building of the second temple ("in the sixth year of Darius" -- Ezra 6:15). Both dates are well established in secular histories as 586-585 and 516-515 B.C. There were 70 years from the destruction of the first temple (Jer.52:12-13) in the "nineteenth year of Nebuchadnezzar" (52:12) and "eleventh year of Zedekiah's reign" (2 Kings 25:2), to the building of the second temple "in the sixth year of the reign of Darius" (Ezra 6:15). However, just as there were several captivities, so also there were several returns from captivity -- each after a different 70-year period. Because Israel refused to let the land rest (Jer.25:7-8;Jer.29:10; 2 Chr.36:21), God caused the land to lie desolate for a seventy-year period from 609 B.C. when the Egyptians, coming to the aid of the Assyrians at the city of Haran on the Euphrates, were defeated by Nabopolaser (father of Nebuchadnezzar) and all the nations between Mesopotamia and the border of Egypt began to "serve the king of Babylon 70 years" (Jer.25:11) until Cyrus and his army came and destroyed Babylon in 539 B.C. and Cyrus allowed the Jews to return the same year (2 Chr.36:22-23; Ezra 1:1). Judah was a vassal of Egypt in 609 B.C. Also 606 B.C.when Nebuchadnezzar's captivity of the Jews began to 536 B.C. when the first return took place is another 70 years (Dan.1:1). Both the process of captivity and the process of return took about twenty years. 9.) 516-515 B.C. to 458- 457 B.C. ; 58 years; Ezra 6:15; Ezra 7:7; From the sixth year of Darius to the seventh year of Artaxerxes (when he gave the command). Cambyses reigned from 529 to 522 B.C. Darius reigned from 521 to 486 B.C. Artaxerxes reigned from 464 to 425 B.C. 457 B.C. to 408 B.C. is defined by Daniel 9:24-25 as being "seven weeks." Christ's ministry lasts till the middle of the last Sabbatical cycle ("in the midst of the week" -- Dan.9:27) and another occurred in 34 A.D. when Stephen was stoned (Acts 7:59-60). The date of 408 B.C. was when the restoration of Jerusalem was completed. In 27 A.D. the Messiah was immersed and a dove descended (Mark 1:15). In the midst of the week, on Wednesday, 31 A.D., Christ was crucified (Dan.9:27). The four days that the Paschal lamb was kept before being slain have their anti-type in four millenary days preceding the slaying of the Lamb of God. Actually there were four decrees. Darius issued a decree in 519 B.C., and ordered the construction of the temple to continue (Ezra 6:11-12). Again, this decree was for the temple, not the city. The temple was completed by the sixth year of Darius (Ezra 6:14-15) so this could not be the decree spoken of by Daniel. Counting the prophecy from these dates would place us well before Christ's life. The correct decree from which to count was made by Artaxerxes (Ezra 7:1,6; 11:26). Then in Ezra 9:7-9 the decree is described in detail. Ezra praised God by saying, "And now for a little space grace hath been hewed from the Lord our God, to leave us a remnant to escape ... to give us a reviving, to set up the house of our God, and to repair the desolations thereof, and to give us a wall in Judah and in Jerusalem." This decree gave Ezra authority to repopulate the city, organize the government, rebuild the city and wall and beautify the house of God. This decree was made in the seventh year of Artaxerxes (Ezra 7:7-9; Ezra left Babylon the first day of the first month -- Tishri 1 -- and arrived in Jerusalem the first day of the fifth month -- Shebat). (See also Josephus Ant. 11:5:1-2.) Ezra 6:14 shows us that the four decrees were from three Persian kings: "according to the commandment of Cyrus, and Darius, and Artaxerxes." Furthermore, Artaxerxes ordered all work stopped on the temple because the Jews had started rebuilding the city and wall without authority (Ezra 4:11-24). This also proves the decrees of Cyrus and Darius were not complete by themselves. The fourth decree given also by Artaxerxes to Nehemiah in 444 B.C. (Neh. 2) was another starting point of Daniel's 483 years. When Nehemiah arrived in Jerusalem, everybody was already at work building Jerusalem (Neh.2:16) under the authority of the decree they had received thirteen years earlier from Ezra. Nehemiah finished his work in 52 days (Neh.6:15). The city and walls had been rebuilt much earlier, and Nehemiah merely repaired some recent damage to the gates and walls. Also, the date was 444 B.C., not 445 B.C. (Halley's Bible Handbook, p.229; The Bible As History, p.356; etcetera). Actually, once you determine the date of the decree of Artaxerxes (in his seventh year), then it is easy to determine the date of Nehemiah's commission since it was in the 20th year of Artaxerxes (Neh.2:1). Nehemiah 1:1-2 shows that Nehemiah's brother came from Susa in December (Chislev) to report the sad situation at Jerusalem. Four months later (Nisan), in the spring of 444 B.C., Artaxerxes' 20th year, the king gave permission for Nehemiah to go to Jerusalem (Neh.2:1-8). The decree of Artaxerxes was issued in 457 B.C. in the seventh year of Artaxerxes' reign (Ezra 7:7). But how can we prove it was 457 B.C.? An ancient papyrus document, dated with two calendar systems, written during the accession year of Artaxerxes, has been found and is now in the Brooklyn Museum. It was written from the Jews of Elephantine in Egypt, and is dated the 18th of Kislev or the 17th of Thoth, "in the year 21 [21st year of the reign of Xerxes], the beginning of reign when King Artaxerxes sat on his throne." This date corresponds to the evening of January 2 or the daytime of January 3, 464 B.C. (Jews reckon days from sunset to sunset). According to Jewish reckoning, if his accession year began January 2/3 in 464 B.C., then his first regnal year could not officially begin until Tishri 1, in the autumn of 464 B.C. (For proof see most any recent book on Old Testament chronology, such as those by Thiele.) Seven years later would be 458 B.C., and the seventh year of Artaxerxes was from autumn 458 to autumn 457 B.C. That the Jews were using the autumn to autumn calendar can be proven by studying Nehemiah 1:1 and 2:1, which say Chislev or Kislev preceded Nisan in the 20th regnal year of Artaxerxes. Ezra's journey took place from Babylon to Jerusalem at the end of summer, Tishri 1 (Ezra 7:9), 457 B.C. The "going forth" occurred when Ezra left Babylon on Tishri 1 (First day of first month). Final departures occurred Tishri 12 (Ezra 8:31). The starting point of the prophecy was Tishri 1. The dating of this decree is proven by evidence given in Ptolemy's Canon; by the Saros Tablets; by the Aramaic papyrus AP 6; in Langer's Encyclopedia of World History p.53; The Chronology of Ezra 7 by Siegfried Horn and Lynn Wood; E.G. Kraeling's The Brooklyn Museum Aramaic Papyri pp.191-193; Babylonian Chronology by R.A. Parker and W.H. Dubberstein; Sidney Smith's Babylonian Historical Texts; and the Greek Olympiads. We believe Christ's halftorah reading began on a Jubilee Year (Luke 4:18-19) in 27-28 A.D. (see Josephus' dessertation V). This was also 69 weeks "unto the Messiah" (Dan.9:25) when his public teaching began (457-456 B.C. + (69 x 7 = 483 years) = 27-28 A.D.) at the age of 30 (Luke 3:23). He was "cut off" "in the midst of the week" of seven years (Dan.9:26-27) which brings us to the spring of 31 A.D. on Passover (John 13:1). By 34-35 A.D. Stephen was stoned and the gospel was preached to the gentiles (Acts 9:15). After about 2000 years, mankind is now almost 6000 years old and weary and in need of a Millenial rest.